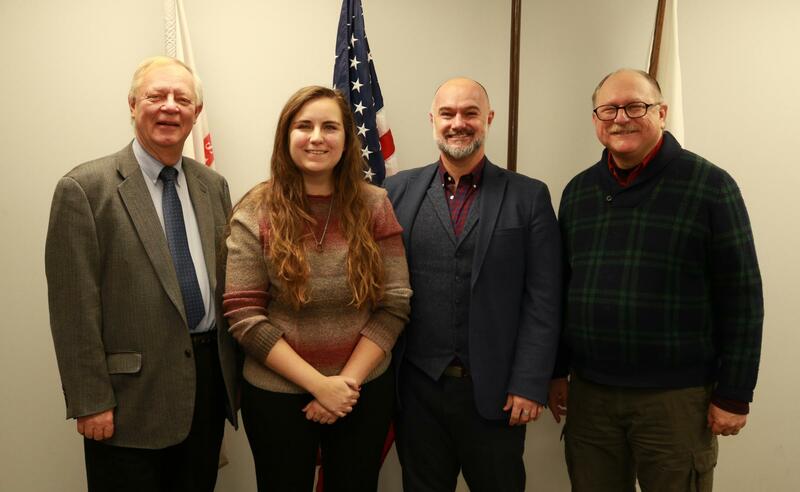 ITM student Akvile Kiskis, pictured here (2nd from left) with Kevin Nutley (3rd from left), Vice-President of Student Affairs of the Washington Center, met with the School of Applied Technology Dean, Dr. Bob Carlson (far left) and ITM Department Associate Chair, Professor Ray Trygstad (far right) to discuss the prestigious fellowship Kiskis was awarded --The Foreign Affairs Information Technology (FAIT) Fellowship. The FAIT fellowship is funded and managed by the U.S. Department of State and administered by the Washington Center (TWC) for Internships and Academic Seminars, the largest and most established internship program in Washington, D.C. The fellowship seeks to aid talented students from diverse backgrounds with outstanding leadership skills and academic achievement in the area of Information Technology, to pursue a career in the Foreign Service. Women and minorities, historically two vastly underrepresented groups in the field of IT, and students with financial need are strongly encouraged to apply. Recipients of the FAIT Fellowship receive two years of financial support, mentoring and professional development to prepare them for a career in the Foreign Service. Fellows also complete a domestic internship at the U.S. Department of State in Washington, D.C. and an overseas internship at a U.S. embassy. Kiskis is one of four students selected for the first cohort of this fellowship in 2017. Pursuing her co-terminal degree in the ITM Department, Kiskis completed her D.C. internship this summer. Akvile states, "The FAIT Fellowship has opened up opportunities for me that I would have otherwise never had. For example, during my domestic internship this past summer, I got the opportunity to shadow the State Departments Red Cell Team for a few weeks. They knew I had no experience at all, but I wanted to learn what they do, and the team was extremely welcoming and taught me so much in the few weeks that I was there." For more information on the Information Technology and Management Department, please visit https://appliedtech.iit.edu/information-technology-and-management.